Opening with close up shots of a disturbed looking Eddie Marsan as he greedily swigs from miniature whisky bottles and rummages through the remains of a littered ash tray, the beginning of Tinge Krishnan’s latest work sets the scene perfectly for what’s about to follow. This isn’t going to end happily! London may be a city of culture, a city of opportunities, a place where the streets are said to be paved with gold, but on-screen England’s glorious capital has become synonymous with the dark undertones of British Realism. At the centre of Krishnan’s celluloid tale of big smoke life we find two desperate, tortured souls; Frank an ex-soldier struggling to overcome the horrors he witnessed in combat and Lynette a homeless girl aimlessly stumbling through life, bad decision after bad decision. Initially, when the downward spirals of these two wayward characters entwine, it seems like just maybe these kindred spirits were meant to rescue each other from their meaningless lives. However, the positive impact they have on each others’ lives doesn’t last long and soon both are rapidly dragging each other down a path of destruction. Followers of short film may already be familiar with Krishnan’s style, as the director’s memorable short Shadow Scan not only won her a Bafta back in 2001, but introduced her as a talented filmmaker on the British filmmaking scene. Flashes of the flair she displayed in her award winning short can be seen once again in Junkhearts. This may be a gritty, hard-hitting film, but it’s certainly not a case of substance over style. Krishnan’s feature has a certain swagger and confidence about it that feels as if it’s coming from the capable hands of an assured filmmaker, a director eager to master her craft. Ultimately though, the powerful performances and confident filmmaking can’t hide the fact that Junkhearts feels all too familiar. These are well trodden streets and it’s going to need something a bit more innovative to make them feel fresh and exciting once again. A promising review full of deserved praise for the film. Ends implying this is well troden territory. Please could the reviewer enlighten us. I’ve seen hundreds of films and very few as powerful as this. As you can probably tell from my review, there was lots I enjoyed and admired about Junkhearts, in particular the powerful performance from Marsan and the odd stylistic flourish from the director. However, after viewing Krishnan’s feature I wasn’t left with that elated feeling you have after you’ve watched a work of true originality, but instead the slightly disappointed tang of familiarity. Feeling like part Dead Man’s Shoes & part Naked, yet not as powerful or revelatory as either, there just seemed to be something missing in Junkhearts to elevate it to greatness. Maybe it’s unfair to compare it to the work of Leigh, Clarke or Meadows, but as a fan of British Realism, these are the films I’ve grown up on, films I love as an Englishman. I am yet to see Considine’s Tyrannosaur, maybe that would be a fairer comparison. I think the overall tone of my article shows I enjoyed the film and if this was a rating website, it’d be getting a fair few stars and I wanted to reflect that in my post (which is why I kept any negative comments to minimum). 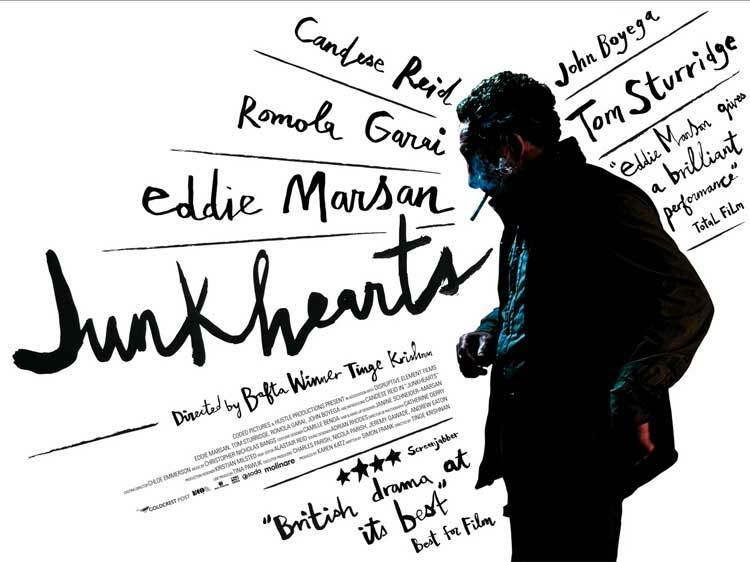 However, watching a lot of films every year, I do always look for greatness in films and want to be blown away by what I see on screen and unfortunately, Junkhearts didn’t quite manage that! This is obviously just 1 mans opinion, but that is all I can give!